Are you missing some items for your Christmas stockings or are you looking for a neat idea to bring a smile to someone’s face? The Body shop Canada is coming at you hard and fast with this huge sale where you can either gift your purchase or stock up on them for yourself. Check out their selection of gift ideas and get 3 items for $30; that’s a savings of up to $78! For even bigger savings, bookmark our Body shop Canada page to reap in the discounts. The shipping deadline for Christmas is also closing in for most provinces, with the bulk of them ending on December 16th 2012. This is a great chance to save on some good products and get them just in time for the holidays. 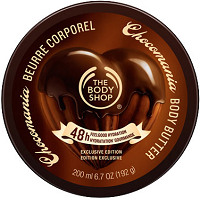 Be sinfully delicious with this Chocomania body butter, which is apart of this sale. While it regularly goes for $19, by getting 3 of them in total, you save $27 off your order. For something that will make you smell divine, that’s a fantastic price! How happy would you be if you were to get this Vitamin C Skin boost in your stocking this year? Topping out at $26 by itself, if you were to pick up 3 of them, you would be able to save a super amount of $48. That’s insane! What are you planning to get me….euh, I mean, your friends and family this year?